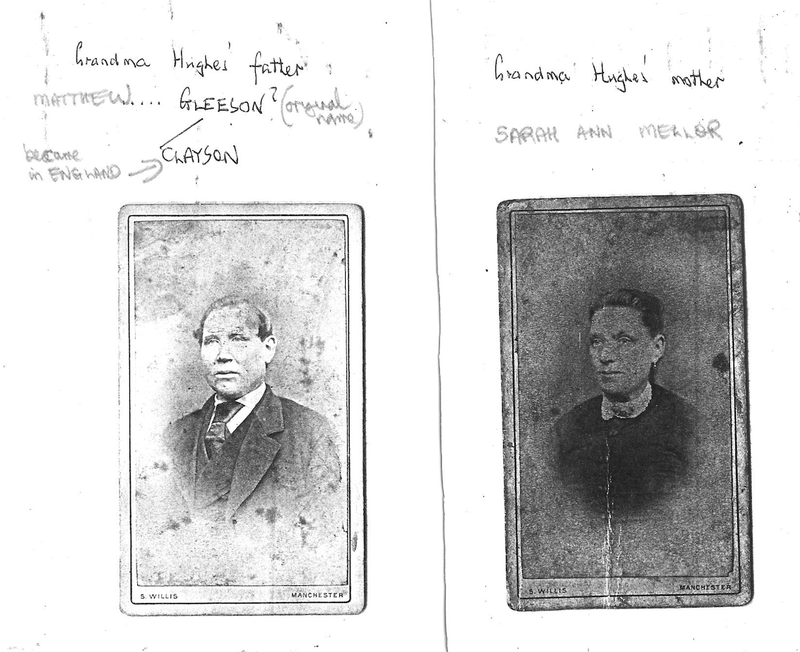 The following account from Chris Hughes highlights the difficulty tracing family back before 1800 in Ireland but it also demonstrates how the GLEESON surname evolved over time into CLAYSON. If you have a story about your Gleeson family, please send me an email about it and I will work it up into a blog post for this website. Thanks. My name is Chris Hughes, born in Manchester, England. I worked as a teacher, lecturer and inspector for 35 years. I retired to live in Portugal in 2006. 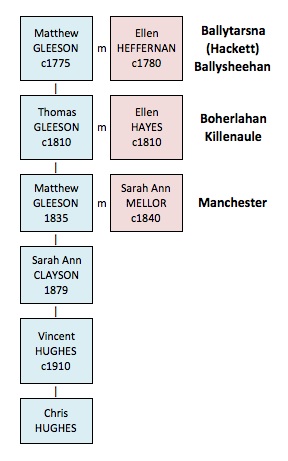 My connection to the Gleeson clan is through my paternal grandmother, Sarah Ann Clayson who was born in Manchester in 1879, the daughter of MATTHEW CLAYSON, my great-grandfather. He came to Manchester round about 1852 to work initially as a servant. The family story is that his accent was so difficult to understand that over time his surname went from GLEESON to CLEASON to CLAYSON. Each of those changes in surname can be tracked on the certificates of his two marriages. Sarah Ann Clayson married Henry Hughes, one of whose children was Vincent Hughes, my father. Thomas came from the Catholic parish of Boherlahan, townland Ballytarsna (Hackett). Thomas and Ellen and their children with the exception of Matthew, my great-grandfather, emigrated from Liverpool on 31 May 1854 and landed at Moreton Bay, Queensland on 14 August 1854. Just prior to their emigration Thomas, Ellen and their family were living in the townland of Cooleagh in the civil parish of Graystown. Thomas died on 3 December 1858 at Cannings Down, Warwick, NSW from consumption. Ellen married again the following year but was deserted by her new husband the day after the ceremony. She died 24 December 1887. I am fairly confident that my g.g.g. 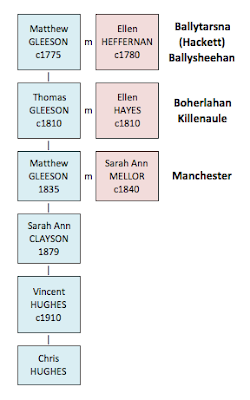 grandfather was Matthew Gleeson who came from the townland of Ballytarsna (Hackett) in the civil parish of Ballysheehan – he married a Ellen Heffernan – the two definite traces of him are a baptismal record for Thomas for 7 April 1810 in the parish of Boherlahan; sponsors Thomas Meagher and Margaret Farrell; the other trace again in the townland of Ballytarsna is for 1827 in the Tithe Applotment for Ballysheehan. It is interesting to note that in the 1766 religious census for Ballysheehan there are three Gleesons living there – a John, Michael and James – perhaps related to Matthew? I cannot trace any record of the death of Matthew or any siblings of Thomas. I am in touch with a cousin, third removed, in Australia whose great-grandfather was James Gleeson, the younger brother of Matthew Clayson, my great-grandfather. I am also attaching a picture of my great- grandfather MATTHEW CLAYSON taken about the 1880s. I hope the above is of interest and would be delighted if anyone could fill gaps about my g.g.g. grandfather, Matthew and possibly relatives in and around the Ballytarsna Hackett townland and the wider area. If anyone has any clues about this family, please contact Chris (vc.hughes AT btinternet.com ... substitute the AT for an @). I am also looking for relatives with the surname Gleeson. My father William Benedict Gleeson was born in Bathurst NSW Australia in 1929 and lived in nearby Perthville. His father was William Patrick Gleeson. Dad is first cousin to the artist James Timothy Gleeson.